Well folks, there goes the first month of 2011! And what an amazing month it was to start off the new year with! 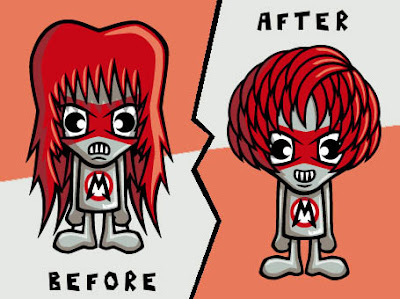 A month in which we got to see a Frost Mascot playset, a Doll Mascot paper doll, and even a Metal Mascot makeover. And of course we also got to meet some fantastic crafters, designers, and shops along the way, including Chocomari, SouZouCreations, and Tofu Cute to name just a few! And let’s not forget our monthly puzzle! Did you work out which mascot had appeared in the night sky? Incredible! It was the Robot Mascot! I wonder if the boffins at NASA know about this stunning new constellation. Perhaps I should write them a letter? Anyway, while I ponder the consequences of this newest astronomical discovery, you wonderful readers can rest assured that one thing is certain… the KawaiiPunk Blog will return as ever next month! Hurrah! And, what with Valentine’s Day being just around the corner, we may even feature some romance too! Can you imagine? Ghoulishly good, isn’t it? 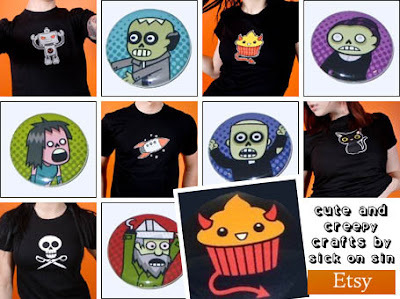 Sick On Sin is an Etsy shop that specialises in creating super cool t-shirts, buttons, bags, and more that manage to combine the cute and the creepy in perfect measures. Zombies, devils, and vampires are all in attendance, and all looking extremely cute! But don’t think this is just a store for horror fans, because it’s also got some seriously sweet designs too. In fact, this is one shop you can definitely say has something for everyone! Have fun! That’s right, it’s a paper doll Doll Mascot toy I made in my lunch hour! Pretty cool isn’t it? 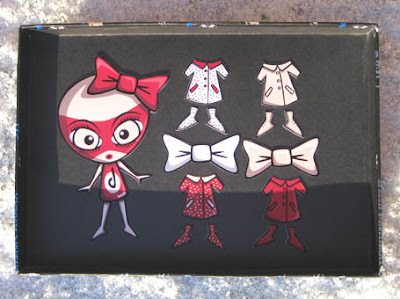 As you can see I have created a number of different outfits and accessories for the doll to wear, and I reckon any little girl would love this as a birthday present! Actually, I’m more than reckoning, I’m stating my reputation as a father on it! What? We all forget to buy our kids a proper birthday present now and again! Don’t we? Wow! That’s actually pretty cool for a guy who forgets his own daughter’s birthday! I just hope she’s not reading this! After all… we wouldn’t want you to look a fool, would we? Ta da! Pretty cute, isn’t it? 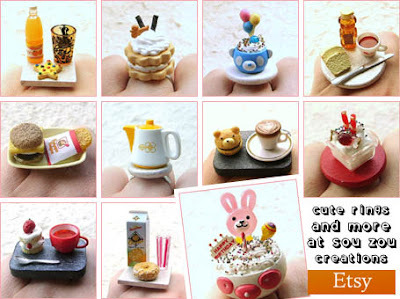 What you are looking at are just some of fine products available to you at the kawaii-tastic Tofu Cute shop. 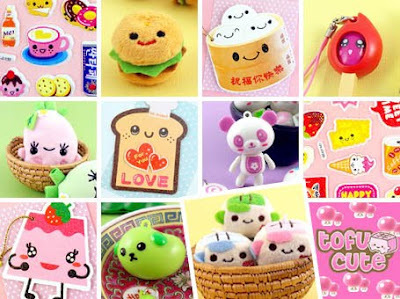 Tofu Cute is a UK based kawaii shop that strives to bring its customers the cutest goodies, gadgets, and gifts the world has to offer! And, as far as I’m concerned, to say they’re doing a good job in this quest would undoubtedly be the understatement of the decade! And we’re not even through the first month of it :) Enjoy! You see, despite what people may say, our good friend the Mystic Mascot actually does put a lot of work into her horoscope predictions. No honestly, she does! But recently, while plotting the moon’s rise in Capricorn or something, she noticed a very strange sight in the night sky! 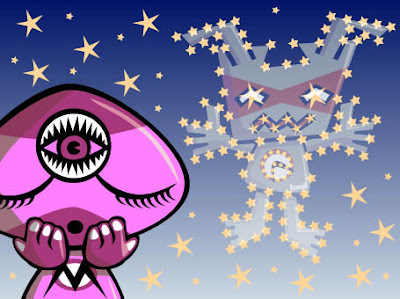 It seems that a new constellation has appeared in the shape of a KawaiiPunk Mascot! 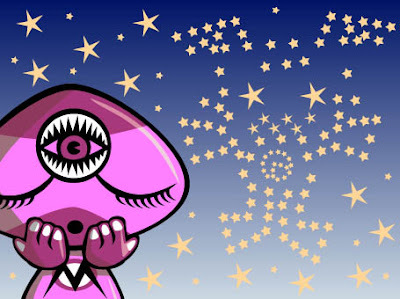 The question is… can you work which mascot has appeared in the night sky? The answer, as ever, will be revealed in this month’s monthly round-up! Amazing, isn’t it? By the simple act of cutting your hair and dispensing with that foolish grimace of yours, I’ve managed to turn you from Metal Monstrosity to Beguiling Beauty. And who doesn’t want that? Another resounding success in my growing portfolio of magic mascot makeovers. Any thoughts? While I agree the makeover you have presented me with is indeed amazing, I fear the reasons for my describing it as such may be very different from your own! And, now that I think about it, I’m not too sure about your “Beguiling Beauty” assertion either! See what I mean? 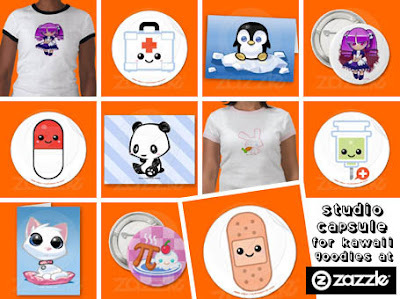 What you are looking at above are just some of the fantastically fun products available to you at the Studio Capsule Zazzle store. And what a party packed store it is! A store where you can find t-shirts, stickers, mugs, buttons, cards, and much, much more besides - all adorned with some of the cutest, not to mention fun filled, characters you’ll ever see! So don’t let the January blues get you down, just head on over to Studio Capsule and let the party start all over again! 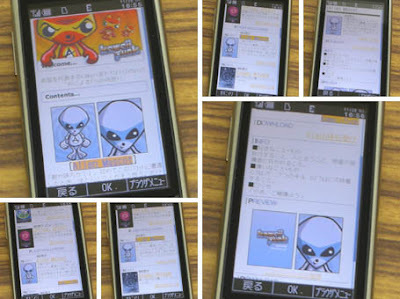 Yes, thanks to the sterling work of DENKI-MIRAI and the wonderful wizardry of Field System Inc., the fine citizens of Japan can now enjoy animated KawaiiPunk wallpapers on their mobile phones! And the honour of being the first mascot to grace these groovy gadgets goes to our old friend the Alien Mascot! Congratulations! I wonder who’s going to be next? 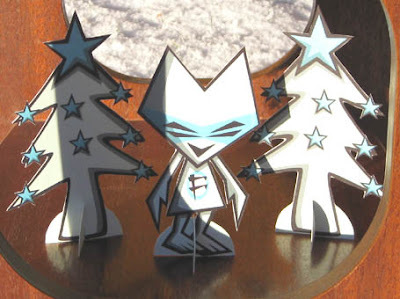 Yes, it’s a fun and funky cut out and keep Frost Mascot playset! And what’s more, my grandchildren absolutely loved it! In fact, they loved it so much, I think I’m going to do the same thing next year! No more ordering online! No more battles with the Christmas shoppers! No more last minute rush! I can just sit back, take my time, and work at my own pace! All I need to do is decide which one of your mascot colleagues to use next time! Perfect! Absolutely brilliant, Hilda! If I was wearing a hat I would take it off to you! And it just goes to show that snow and ice doesn’t always have to mean winter blues! Marvellous! Pretty sweet, isn’t it? 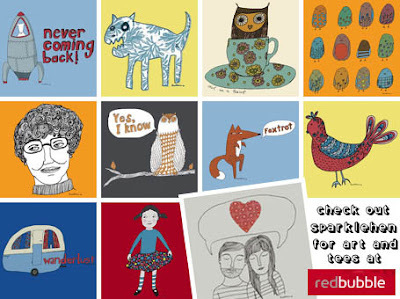 What you are looking at is just a sample of wonderful wares available from the sensational Sparklehen at RedBubble. 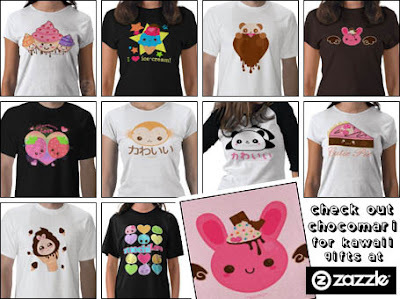 The Sparklehen shop sells t-shirts, clothing, stickers, art, cards, and more, all adorned with beautifully distinctive illustrations than can’t help but impress. So, if you are looking to get 2011 off to a sweet and stylish start, at least now you’ll know where to go! Absolutely incredible, even if I do say so myself! 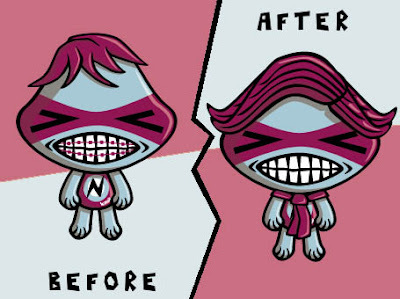 As you can see I have removed your braces, given you a trendy new hairstyle, and even added a stylish scarf to give you a bit more character. I reckon with this new look you could even land yourself a job as a TV presenter. You know, on one of those channels that employ 30 year olds to act like teenagers or something! Can you imagine that? Wow, thanks Tamara. You certainly put a lot of thought and effort into this one. Although, if you don’t mind me saying, I think you may have overlooked one extremely pertinent point - I’m the Nerd Mascot, I’m supposed to be nerdy looking! The new year will herald a plethora of changes in your life. Although, unfortunately, none of them will be good! Sorry! A broken promise to yourself may leave you feeling despondent. But don’t get too down about it, hardly anyone keeps their new year resolutions! Disappointed you didn’t get the festive season you were hoping for? Don’t worry! There’ll be another one along in 12 months! Yipee! A thankless and cumbersome task awaits you this month! Well, did you really need that many Christmas lights on your house? Think on! A welcome slice of normality will return this month like a much loved, long lost relative! Hurrah! No more Christmas shoppers! Wanting the festive season to last a bit longer is totally natural! Trying to make it so by continuing to wear a Santa hat isn’t! Just letting you know! An awkward situation awaits you as go back to work this month. Star thinking of excuses now to explain that staff night out “incident” if you want to avoid this! A mammoth task you once thought unachievable will finally be completed this month! Yep, you’ll finally finish eating that Christmas turkey! Now would be good time to book that summer holiday you’ve always dreamed of. If you hadn’t spent all your money at Christmas that is! Don’t be too alarmed by your partner’s declaration of a new year revolution. It’s probably just a slip of the tongue. At least, I hope it is! Look on the bright side. The joy of the festive season may be over, but that doesn’t mean the drudgery of day to day life has to stop too! Yay!